"How I came into the camp …"
The point of departure for the search of to students for traces in local history was the "Memorial of the Broken Hearts", commemorating the so-called detention camp for Polish juveniles, where the SS had imprisoned Polish youths under inhumane conditions. The topic of the competition was "The Most Important Event in the History of My Home Town. Witnesses and Testimonies". The project presented here was carried out by two secondary school students. They collected reports of contemporary witnesses and carried out research work in the library. The write-up of their work and research findings was handed in as a contribution towards the competition. Łódź-Doły is a typical agglomeration of concrete apartment blocks. From December 1942 to the middle of January 1945, two children's camps were situated in this quarter: the so-called detention camp for Polish juveniles at the ulica Przemysłowa, where Polish children and young people were used as forced labourers, and the so-called Germanisation camp at the ulica Sporna, where other Polish children and young people were turned into Germans. In 1947, the communist municipality had all remains of the camps removed to make room for a "socialist, optimistic city quarter" without any remnants of the terrible past. Until 1964, the camps were not spoken about. In 1968 it was mentioned for the first time that a memorial should be dedicated to the martyrdom of the children; it was to be built from the money young people raised all over Poland by selling metal scrap and waste paper. 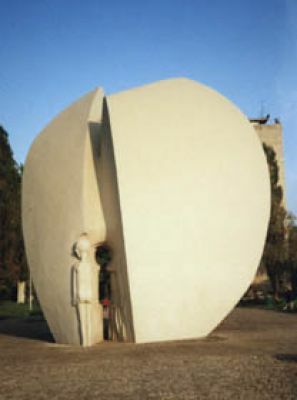 The memorial was inaugurated on 9 May 1971. 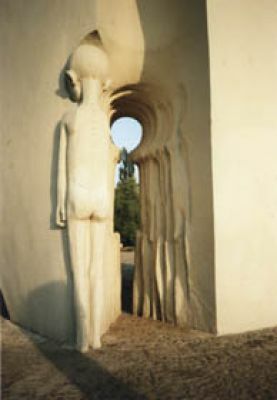 It shows the figure of a naked boy in front of a broken heart [see picture "Pomnik Martyrologii Dzieci" – Memorial for the Martyrdom of the Children). Most of the people meeting here several times a year have lost more than their childhood in this place. Nobody except this small group of people, living scattered all over Poland, really keeps awake the memories of the past, and their number is getting smaller every year, amounting to maybe 500 persons today. We meet a woman in the park who is lighting a memorial candle. "Every year it becomes more dilapidated", she tells us quietly, "in a couple of years there will be nobody left, and I don't know if anybody will care to look after the place. To think how much suffering will be forgotten." "We heard that a concentration camp for children used to be here. Were you in that camp?" "I used to be number 11. In the camp we were all just numbers; they took away our childhood, our freedom, our families and our identities and sometimes even our lives." This is how we came upon the history of the camp that had once existed on the grounds of our park. A couple of days later Mrs Barczyńska – our acquaintance from the memorial – invited us into the Kolbe Club to introduce us to other survivors from the camp at the ulica Przemysłowa. This encounter showed us that people we just pass by in the streets are wonderful living history books; but it also showed us how many things and topics around us are left out and forgotten although they deserve our attention. Each of the survivors found it very difficult to talk about the camp because it roused a lot of emotions; however, they all agreed that it was their greatest wish for "their" camp not to be forgotten and to prevent such things from ever happening again. Through our project, we fulfil a plea of the former prisoners at the ulica Przemysłowa: it shall become a brick in the construction of a "Bridge of Remembrance", arching into centuries to come. 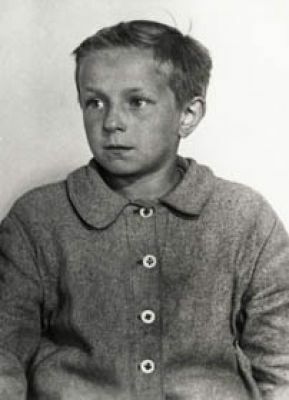 The children's camp at Łódź was set up following a decree issued by Heinrich Himmler on 28 November 1942. The first transports arrived on 11 December 1942. One year later Himmler is reported to say to top-level SS-officers – just as if he was trying to justify his decision: "Take away from other nations everything that could be valuable for our blood, even if it means taking away their children." 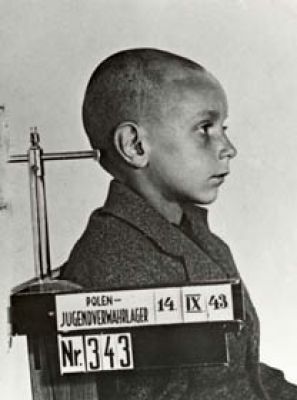 The official purpose of the camp was to keep away alleged under-age "criminals" from the German population in Poland and educate them according to Nazi-ideology. Due to a tremendously high mortality rate, the inhabitants of the camp changed very often. Up to 20,000 children between the ages of 2 and 16 years may have gone through the camp. Exact numbers cannot be established as the camp administration tampered with the records, giving lower numbers of deaths and indicating wrong causes of death. The mortality was very high although there were neither gas chambers nor crematoriums in the camp. As so many children perished in Litzmannstadt, the camp was often called "Little Auschwitz". Each day at the camp started and ended with a roll-call. After the morning roll-call, the little prisoners were assigned their work tasks. They had a number of different tasks (sewing, straightening needles etc. ), most often they were used for needs of the Wehrmacht (German army) [see document 2: Life at the camp]. The most terrible memories are related to the so-called "sick station" which was in fact a "death station". Severely ill children who were no longer able to move by themselves were brought there. The sick station was headed by Sydomia Bayer, the head of the camp who was given this job because she had undergone a course in First Aid before the war. She used a stick to "examine" if children were well again. Maria Jaworska (no. 501) remembers how Sydomia chased 10-year-old Teresa Jakubowska out into the yard barefoot in February 1944 because she had wetted her bed. She beat her and poured cold water over her. Teresa died a few days later. The camp records state tuberculosis as the cause of death. Children were abused in experiments by infecting them with various diseases, allegedly to test new methods of treatment on them. The most common remedies were salt, which was supposed to cure hepatitis, and Lysol for disinfecting wounds. A special group of prisoners were those children selected for so-called Germanisation and to be brought to Germany. A first inspection of these children was done at the camp school where the youngest children were taught German and discipline. 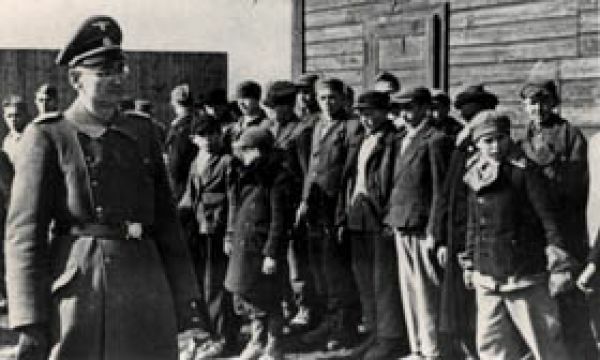 A further selection according to racial criteria was done during special roll-calls which were attended by camp commander Ehrlich and members of the Race and Settlement Main Office (RuSHa – Rasse- und Siedlungshauptamt). The most important criterion was so-called Aryan looks, i.e. blue eyes, fair skin and blonde hair. The potential "Germans" were then accommodated at a former cloister building at the ulica Sporna (at the so-called Rasseamt [Racial Office]). Here, the principle of the carrot and the stick was applied. Children who did well in their lessons and followed the camp rules were awarded. They received special rations like rolls with margarine, jam or sausage, even sweets. An atmosphere of mutual mistrust was created at the camp, and the children were made to believe that the camp management would see everything. The children did not stay here more than a few weeks. During this time they were observed and examined before a decision about their further destiny was made: they were either classified as "racially valuable" or "racially invaluable" [see document 3: the Germanisation Camp]. 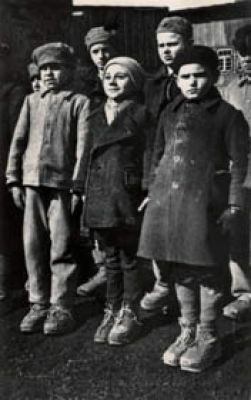 Most children at the ulica Przemysłowa died from diseases, physical injuries or exhaustion. About 1,000 persons lived to see the liberation. The fate of an unknown number of little prisoners has remained unclear until today as there were also children who just passed through the camp in transit to other locations. The Germans fled from the camp on 18 January 1945 [see Document no. 4: The Liberation of the Camp]. Part of the prisoners disappeared into the town which was unknown to them. Some were found in empty houses, cellars or house entrances, hungry and chilled to the bone. Some found protection and shelter with Łódź families, others moved on towards home. Some 230 children found loitering in the streets were brought into the municipal welfare station which had been set up swiftly. How did the lives of the former camp prisoners go on? Is human memory selective enough to forget a nightmare you cannot wake up from? Did they get on with their lives, did they learn to trust people once more or to sleep at night without fear of being "visited" by the camp guards? Going back to a normal life was difficult. The psychological damage caused by the camp affected many areas of life. Reality without barbed wire fence was different, but for a long time it did not inspire confidence. Some children, like for example Zofia Kowalewska (no. 5963) were scared of everybody even looking in their direction for many years after the end of the war. The cruel childhood experiences affected the former prisoners' entire adult life. Weak health and, above all, the psychological injuries sustained, took effect even years later. Wacława Barczyńska reported that she often screams at night even today. She suffers from nervous delusions, seeing e.g. rats scurrying across the floor. All former prisoners suffer from states of anxiety resulting from their time at the camp. While working on their project about the detention camp for Polish juveniles the authors could convince themselves that the number of witnesses dwindles as the years go by and facts get wiped out gradually, memories become deceptive and the traces of crimes disappear. The former prisoners' fragmentary pieces of remembrance are the only guarantee for the continuity of the history of the children's camp and the only form of knowledge about life and death behind the wire fences of "Little Auschwitz" that is available to future generation. Most of today's young people do not know anything about those events, but the few witnesses of the crime who are still alive today do not want it to be forgotten. For we must not forget.